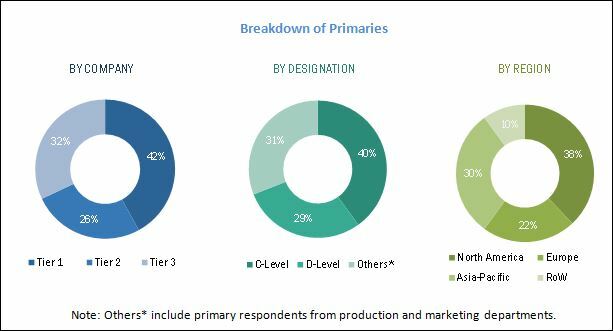 [141 Pages Report] The automotive connectors market, in terms of value, is projected to grow at a CAGR of 7.46% from 2016 to 2021. The market was estimated to be USD 4.38 Billion in 2016, and is projected to reach USD 6.28 Billion by 2021. In this study, 2015 has been considered the base year, and 2016 to 2021 the forecast period, for estimating the market size of the market. The report analyzes and forecasts (2016 to 2021) the market size, in terms of volume (million units) and value (USD million), of the automotive connectors market. The report further segments the market and forecasts its size, by volume and value, on the basis of region (Asia-Pacific, Europe, North America, and Rest of the World (RoW). It provides a detailed analysis of various forces acting in the market including the drivers, restraints, opportunities, and challenges. It also segments the market and forecasts its size, by volume and value, on the basis of Connection Type (Wire to Wire Connection, Wire to Board Connection, and Board to Board Connection). Additionally, it segments the market and forecasts its size, by volume and value, on the basis of application (Body Control and Interiors, Safety and Security, Engine Control and Cooling System, Fuel and Emission Control, Infotainment and Others). The report strategically profiles key players and comprehensively analyzes their market shares and core competencies. It also tracks and analyzes competitive developments such as joint ventures, mergers & acquisitions, new product launches, expansions, and other activities carried out by key industry participants. The research methodology used in the report involves various secondary sources such as Society of Indian Automobile Manufacturers (SIAM), China Association of Automobile Manufacturers (CAAM), Japan Automobile Manufacturers Association (JAMA), and paid databases and directories. Experts from related industries and suppliers have been interviewed to understand the future trends of the automotive connectors market. The bottom-up approach has been used to estimate and validate the size of the global market. The market size, by volume, has been derived by identifying the country-wise production volumes and analyzing the demand trends. The ecosystem of the automotive connectors market consists of manufacturers such as TE Connectivity (Switzerland), Delphi Automotive (U.K.), and Sumitomo Electric (Japan), research institutes such as the Automotive Component Manufacturers Association of India (ACMA), Automotive Research Association of India (ARAI), European Automotive Research Partners Association (EARPA), and the United States Council for Automotive Research (USCAR), and regional automobile associations such as China Association of Automobile Manufacturers (CAAM), Japan Automobile Manufacturers Association (JAMA), and the European Automobile Manufacturers Association (ACEA). The automotive connectors market, in terms of value, is projected to grow at a CAGR of 7.46% from 2016 to 2021. The market was estimated to be USD 4.38 Billion in 2016, and is projected to reach USD 6.28 Billion by 2021. The growth of the automotive connector market is fueled by the increasing number of electronic components and advanced safety features in vehicles, and rise in the number of autonomous vehicles across the globe. The global market has been segmented on the basis of connection type, system type, application, vehicle type, and region. The market has been segmented on the basis of connection type into wire to wire connection, wire to board connection, and board to board connection. The wire to board connection segment was estimated to account for the largest market share, in terms of value, in 2016. The increase in the number of electronic components used in vehicles and rise in demand for automotive safety systems have been the key drivers for this market. The global market has been segmented by application into body control and interiors, safety and security, engine control and cooling system, fuel and emission control, infotainment and others. The safety and security segment was expected to hold the largest market share, by value, in 2016. 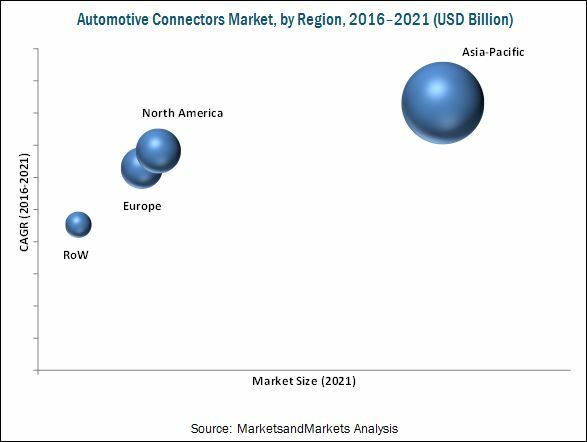 The rising electrification in vehicles has been a key driver for the automotive connectors market. Advanced vehicle safety technologies have also increased the number of connectors used per vehicle. The Asia-Pacific region was estimated to dominate the automotive connectors market, in terms of value, in 2016. The rising consumer income levels, increased vehicle production in developing countries such as China, and rise in electric vehicles in countries such as Japan have all added up to the growth of the market in the Asia-Pacific region. One of the major concerns for manufacturers in the automotive connectors market is to meet reliability and durability standards. Nowadays, vehicles are equipped with heavy electronic components to control critical systems including airbags, GPS navigation etc. The connector solutions are able to withstand both low and high frequency solutions. Therefore, electronic components used in critical systems must be reliable and durable, as a failure in such systems could have disastrous results. TE Connectivity is a leading player in the automotive connectors market. The company operates in three business segments: transportation solutions, industrial solutions, and communication solutions. The organization provides connectors solutions, sensors, contactors, vehicle wire and cable products, lighting assemblies, mobility solutions, and mechatronic components for the automotive industry. TE Connectivity has manufacturing operations in over 20 countries in addition to a global sales distribution. It has also collaborated with Molex Incorporated (U.S.) to provide new generation high speed input/output connectors and a partnership with Andretti Technologies (U.S.) to advance technology in auto sports and electric vehicles. 12.4 Sumitomo Electric Industries Ltd.
12.5 Japan Aviation Electronics Industry, Ltd.
12.10 JST Mfg. Co., Ltd. Figure 48 Company Snapshot: Sumitomo Electric Industries Ltd. Figure 50 Company Snapshot: Japan Aviation Electronics Industry, Ltd.